In a simple explanation, Lean Six Sigma can be described as a statistical method to eliminate waste and improve efficiency in an organization’s processes. Having a history dating back to Motorola and being defined as eliminating defects, Lean Six Sigma has been taken to an extraordinary level that spans across an array of industries beyond manufacturing. Now found in the service and transactional environment, Lean Six Sigma brings a refreshing outlook on business process improvement for how a company defines, measures, analyzes, improves and controls both operations and financials. 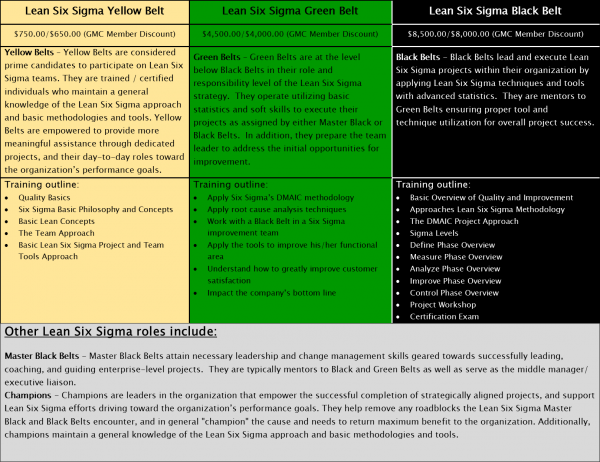 For companies who have chosen to implement Lean Six Sigma throughout their enterprise, they have conservatively impacted their bottom-line with tangible results in the range of $500,000 to $1,000,000. Earn your Lean Six Sigma certification LOCALLY in just one night per week! In order to provide a more convenient and user friendly approach to Lean Six Sigma training and certification, the Mid-South Quality Productivity Center offers an evening Lean Six Sigma Black Belt certification program. This 18-week course will be conducted each Tuesday evening from 5:30 p.m. until 8:30 p.m. at Southwest Tennessee Community College - Whitehaven Center (1234 Finley Road, Memphis, TN 38116). This is a unique opportunity for members of Mid-South organizations to obtain their Black or Green Belt certification while minimizing the time away from their daily work responsibilities. This course is conducted in a live classroom setting as opposed to on-line or blended courses to allow the participant an opportunity for peer-to-peer interaction, problem solving, project reporting, and accountability that cannot be experienced through e-courses. Each participant will work on a project with their respective organization, providing practical experience for the Green/Black Belt candidate, which will enforce the skills they learn in class and produce a tangible benefit for their organization. 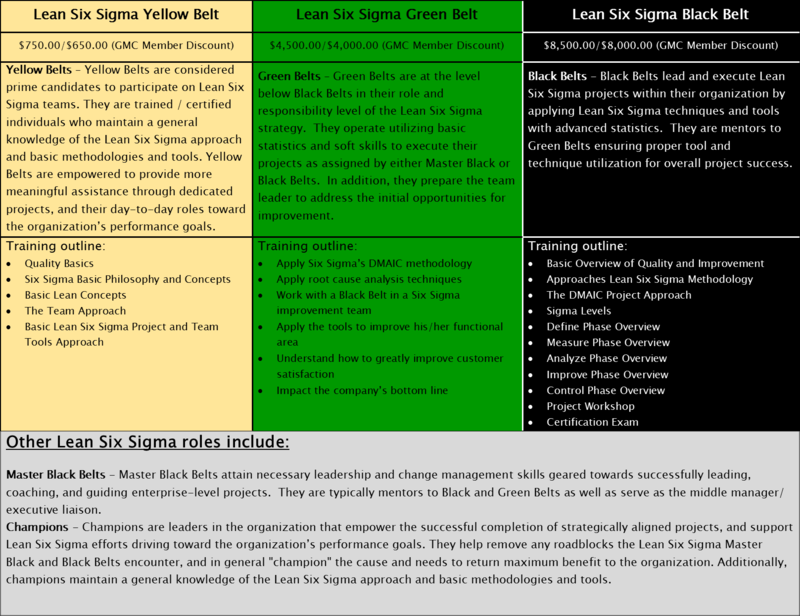 We provide Lean Six Sigma training for yellow belt, green belt, and black belt certifications. Typically, when a company has made a commitment to implementing Lean Six Sigma, the company either chooses to do a ‘top-down approach’ or a ‘bottom-up approach’. Each approach has its pros and cons as would any Lean Six Strategy. Regardless of the strategy, there are roles and responsibilities that are imperative to your company’s Lean Six Sigma success.